Using Agenty, we can extract details page data from a list page. As, most of the website display the search/list page to explore their products, when we search for something or browse by category. But those lists items doesn't have much information and we may need to click on each item to grab further product details by click-through. 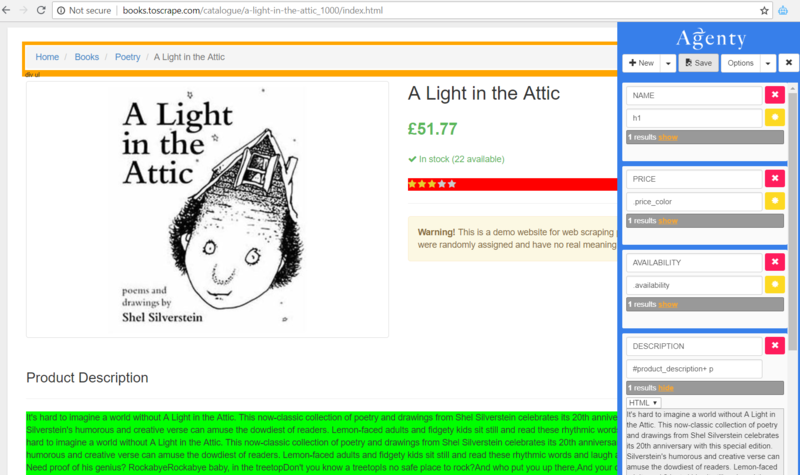 So, it's very important for a web scraper to have such feature, to automate the data scraping of details page from list page. Go to the website list/search page URL. Open the Agenty Chrome extension and setup fields. If you see the screenshot above the DETAILS_PAGE_URL field showing the relative URL. Because Agenty is going to extract exactly as in HTML, but we can always add a Post-processing function to make it full URL by inserting the domain. Remember, we just need the DETAILS_PAGE_URL in our 1st agent and other fields are optional. 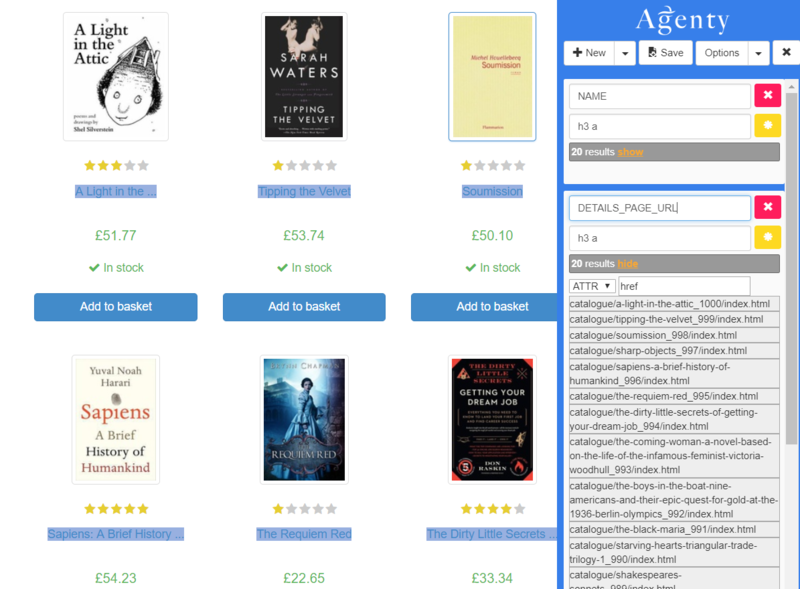 Now, we need to change it's input type as URL from source agent to point the agent to our books list #1 agent. That way, the 1st agent output will be considered as 2nd agent input and this agent will grabs the DETAILS_PAGE_URL from the source agent to extract details for each product. If you see the screenshot above, Agenty grabbed all 20 pages from list agent output and then extracted each details page for ( NAME, PRICE, AVAILABILITY and DESCRIPTION) fields. 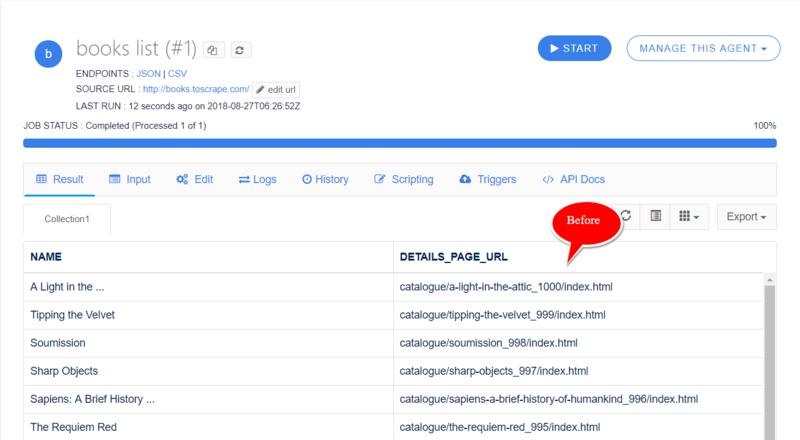 And I also added the default field REQUEST_URL with name as PAGE_URL to better analyze my scraped result, as what page returned in what output. You can learn more about adding default fields here. In most cases, you want to extract more then one page in your list scraper from some product categories or search page. 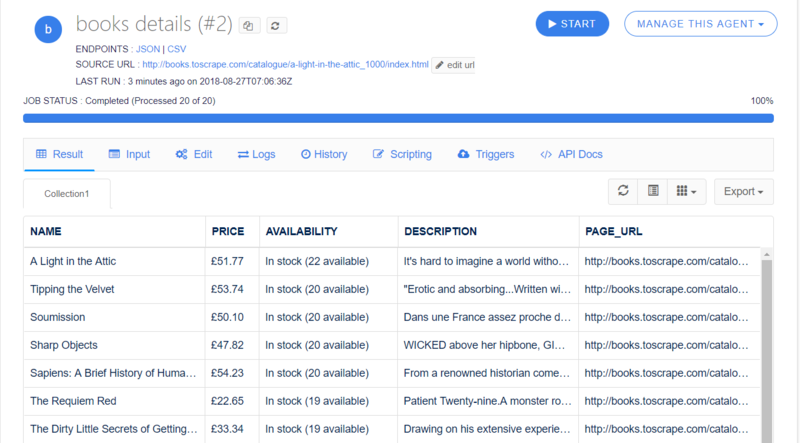 So you can follow this pagination tutorial to get all the products list, before extracting the details of each products. 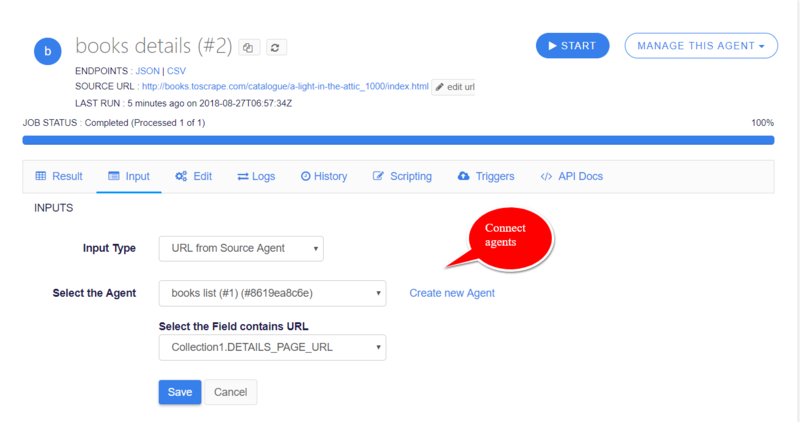 And you can also use the "Start an Agent" Plugin to automatically run the 2nd agent when the 1st agent completes a job and the list is ready to scrape details.